Alimony, also known as “spousal support” or “spousal maintenance,” refers to the obligation of an individual to provide their spouse with financial support after a separation or divorce. Traditionally, alimony was the sole obligation of a husband, but in modern times, wives can be responsible to pay support to their husbands, especially in cases where her income is considerably higher than his. To explore this concept, consider the following alimony definition. Noun. An allowance paid to a person by their former spouse after a divorce or separation is recognized by the court. The concept of alimony dates back to the Babylonian Code of Hammurabi, from ancient Mesopotamia more than 1700 years BC. This ancient law provided that a man must provide sustenance to a woman who has born his children, so that she can raise them. 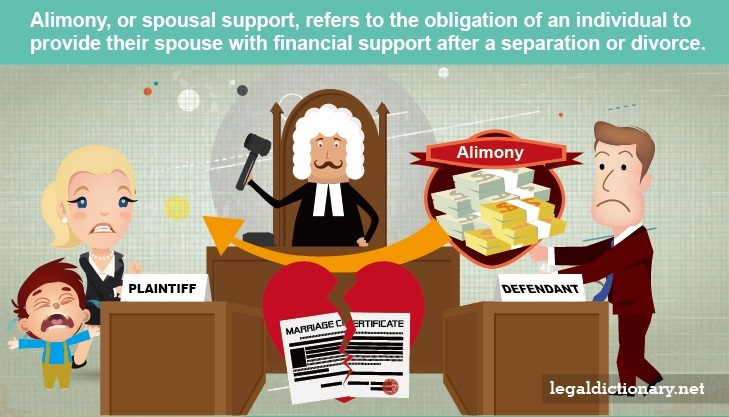 The history of alimony, and concept of spousal support, is mentioned in many codes and laws throughout history, and the modern concept of alimony came from English common law. Through the early history of alimony, English courts believed that, if a man and woman separated, he should continue to support her until the divorce is legally ended. In 19th century, it became commonplace for a man to be ordered to pay his wife alimony if he was at fault for the divorce. If the women committed any acts that lead to the divorce, however, the courts considered her acts to be a forfeiture of the alimony. As time went on, the United States began seeing more no-fault divorces, which required changes to the alimony process. In the 1970s, the U.S. Supreme Court determined that ordering only men to pay alimony constituted gender bias. This decision resulted in more women being ordered to pay spousal support. Each state has statutes, or guidelines, that determine the factors affecting alimony, and the amount of alimony that should be paid. Some states, such as Texas and Utah, have guidelines that are more explicit as to how much alimony should be ordered, and for how long it should be paid. For example, in Texas, alimony may be ordered for 5, 7, or 10 years, depending on the length of the marriage, and the amount that may be ordered is limited to 20 percent of the payee’s income, or $5,000 per month, whichever is greater. Checking an online alimony calculator may give an individual an idea of how much alimony would be required in their case. Length of the marriage. Most states require the couple to have been married for a minimum amount of time. Time separated while still married. Some states do not recognize separation as a factor affecting alimony, so if a couple is married for 6 years and separated for 4 more years, it is considered a 10 year marriage. Other states consider the period of separation different from the actual marriage. Age of the parties. Many courts believe that if the parties are younger, they are more employable, and able to get on with their lives easier after a divorce. The older the couple is, the harder it might be to find or start a career. Income of both parties. The courts look at the income of both parties and adjust the alimony to enable the receiving spouse to live according to the means to which they have become accustomed. Future financial prospects. While alimony is calculated based on what the parties earn at the time of the divorce, in the event one spouse is likely to have a significant increase in the near future, it may affect the amount awarded. Health of both parties. Poor health constitutes more need, so if one party needs medical support, the other person may have to pay more alimony. Temporary alimony is ordered during the period the couple is separated during the divorce proceedings. Temporary spousal support will be reevaluated, and may be stopped or the order modified to continue after the divorce is granted. Rehabilitative alimony is support ordered when one spouse earns considerably less than the other spouse at the time of the divorce. This support is often ordered for a short period of time, with the goal of getting the receiving spouse back into the workforce so that they can support themselves. Permanent alimony is ordered to be paid until one spouse dies, or until the receiving spouse remarries. This type of support is most common when the couple has been married for more than 10 years, but in some states, this is at the judge’s discretion. Reimbursement alimony is support ordered to reimburse a spouse for expenses incurred during the marriage, such as educational costs or medical expenses for the other spouse. This is the only type of support that is not based on income. Rather, its purpose is to compensate a spouse for time or expenses sacrificed during the marriage. Child support and alimony are different, though some people see the two as the same. Child support is paid to the parent or guardian who has physical custody of the children, the money intended to help provide the children with the essentials they need as they grow up. It can be ordered whether the parents are married, divorced, or have never been married. Alimony has nothing to do with children, and its amount and duration are not affected by the presence of children, or whether or not child support is being received. The amount of alimony payments made to a spouse are deductible from the payer’s taxes, and must be counted as income on the receiver’s taxes. This differs from child support, in that child support is excluded from the tax credits and taxable income of both parties. The term “palimony” is sometimes used to describe alimony-like support payments made in a situation where the couple lived together for a significant period of time but never married. Because alimony, or “spousal support,” is by statute an award to a “spouse,” it cannot be awarded in a cohabitation or common law marriage situation. The issue of palimony was made famous during the California case of Marvin v Marvin, in which actor Lee Marvin cohabitated with a woman named Michele for a number of years. When they broke up, Michele claimed that he had agreed to continue supporting her, her defense being that she had given up her career in order to take care of Marvin while they were together. Because of this arrangement, Michele had no way to support herself after the relationship ended. The court ruled that, even though there had been no written contract, the actions of Lee Marvin and Michelle Marvin implied that they had an agreement during their relationship. Not all states recognize palimony. Those that do generally use the same factors used in determining eligibility, amount, and duration of alimony to make their orders. As an incentive for the paying spouse to make such a large lump sum payment, couples often reach an agreement that is mutually beneficial. For instance, Stephanie could agree to accept $50,000 if Matthew makes a lump sum payment, rather than monthly installments. When a spouse is awaiting an alimony order, they may find themselves wondering when alimony stops. While some states place statutory limitations on how long alimony may be paid, the judge generally has some discretion in the matter. The judge will consider such issues as the length of the marriage, the disparity in income levels, and the ability of the receiving spouse to earn a substantial living in determining when alimony stops in any case. When a court issues an order for alimony or other type of family support, the spouse has a legal obligation to pay. In the event the paying spouse refuses to pay as ordered, he or she may be found in contempt of court. The judge may then order a wage garnishment or a levy on his or her property or bank accounts. Attempting to obstructing this type of enforcement of a support order may result in criminal contempt charges. The party receiving alimony may find certain stipulations included in the court’s order. The spouse receiving alimony may be ordered to make certain life changes to help ensure they can support themselves within a reasonable amount of time. The spouse receiving alimony may be ordered to find full time employment, or gain necessary job skills to obtain better paying employment. On occasion, the spouse receiving alimony is ordered to meet with a court appointed employment evaluator to determine their skill level and job prospects. Contempt – A disregard for something, especially an order by the court. Custodial Parent –The parent who is given physical custody of a child by a court of law. Gender Bias – Discrimination against a person based on gender. Jurisdiction – The authority to hear legal disputes and make judgments; the geographical region of authority to enforce justice. Rehabilitative – To restore something back to a state of good health or good condition.